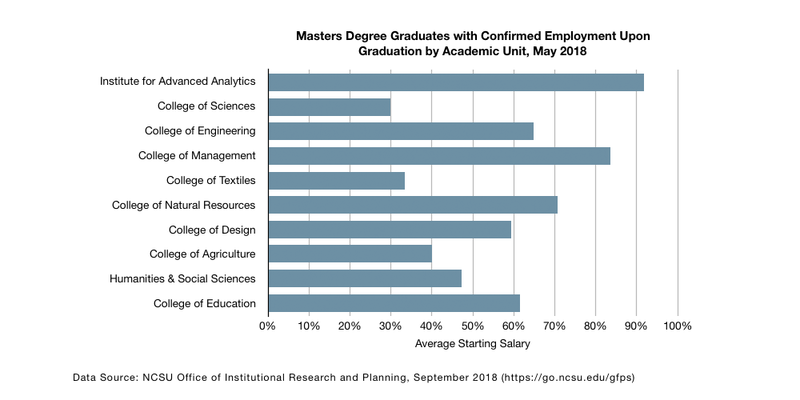 Graduates in the Master of Science in Analytics posted NC State’s highest average salaries upon graduation last May, in a ranking of academic units across campus compiled by the Office of Institutional Research and Planning. 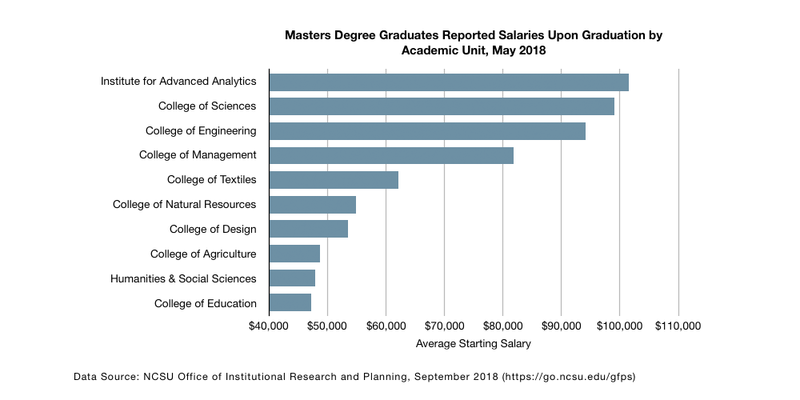 In the University’s first Future Plans Survey for Graduate Students, the Institute’s students ranked at the top among the nine colleges with an average reported salary of $101,454 (based on 110 students and a 99% response rate). 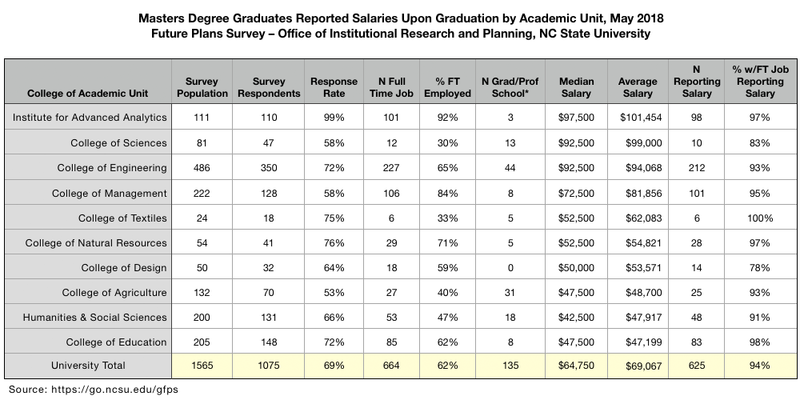 This compares to an average reported salary of $69,067 for all masters students last May (n = 1,075; 69% response rate). MSA starting salaries are 47% higher than the university average. Institute students also had the highest reported employment rate (92%) among the ten academic units. The university confirmed employment rate overall was 62%. The average starting salary for all bachelor’s degree graduates of the University was $52,765 (n = 2,077; 69% response rate). 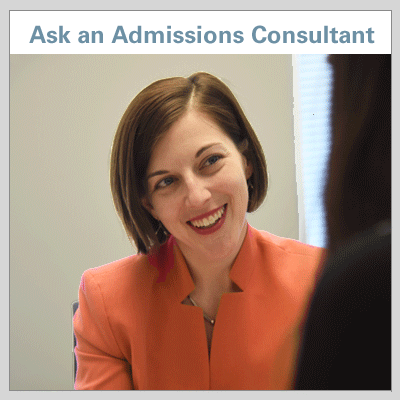 The 10-month MSA yields nearly double the earning potential for graduating seniors. N.B. 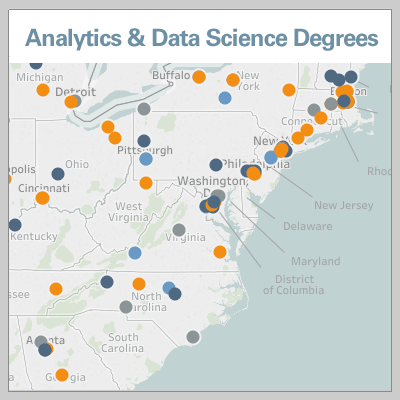 : The Institute for Advanced Analytics operates as an independent academic unit within the University. Comparisons at the department-level are not provided here due to small sample sizes and/or low response rates within individual departments. The minimum response rate and sample size requirement needed to make a valid comparison at the college-level is also a limitation the FPS data. 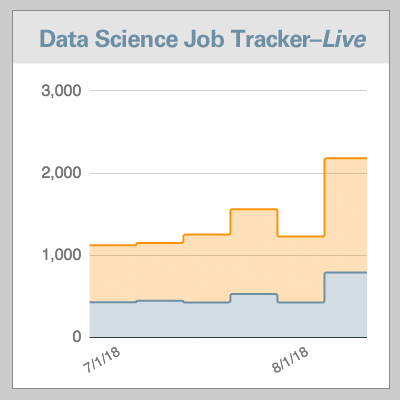 A small discrepancy between the FPS data and the Institute’s own data reported in the Annual Employment Report stems from the timing of the surveys. 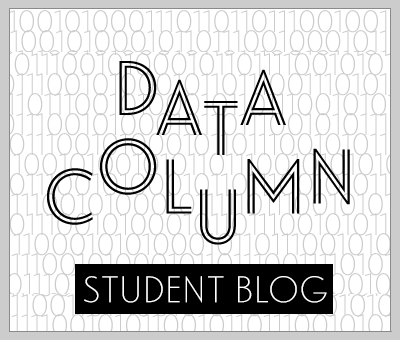 The Institute’s data collection closes a few days later on May 15th of each year. The Institute has published an employment report each year since its inaugural graduating class in 2008. The reports are a full and detailed census accounting of employment outcomes for our students.